A Puzzly Touch of Spring! It snowed over the weekend here on the East Coast, and after a disappointing prediction of six more weeks of winter from some of the more famous groundhogs around the world, you may find yourself longing for spring and all the marvelous greenery it promises. In that spirit, I thought I would dedicate this February day to some mind-bogglingly lovely mazes that combine nature’s beauty with the ingenuity of humans. 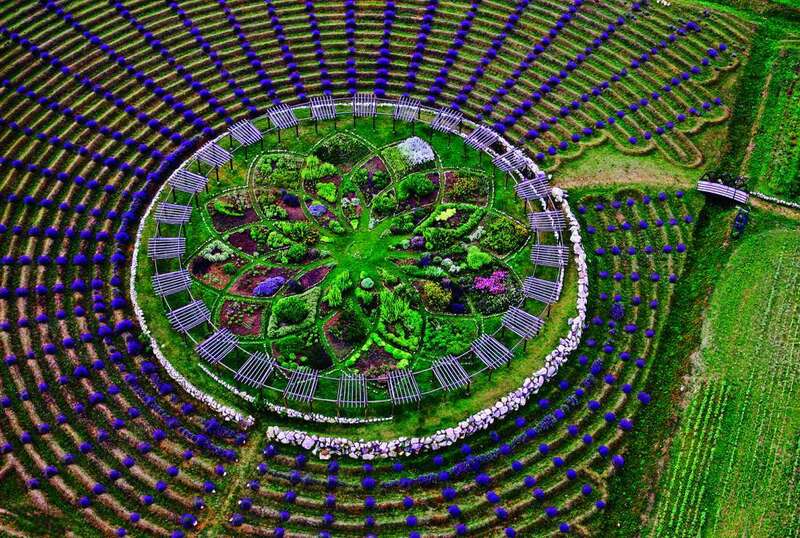 To start, feast your eyes upon the lavender labyrinth at Cherry Point Farm and Market in Shelby, Michigan, one of the oldest operating farms in Michigan. The owner began designing the labyrinth in 2001, and it has since grown large enough to be seen on Google Earth! Finding your way to the center of the labyrinth should take about an hour, and attendance is free! Be sure to visit in mid-July, when the French lavender is in full bloom, and enjoy the gorgeous scenery not far from Lake Michigan. 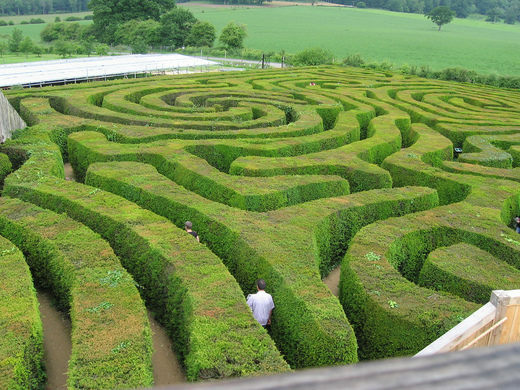 Of course, if you’re looking for a bit more of a challenge when it comes to your homegrown mazes, the Longleat Hedge Maze in Wiltshire, England will pique your interest. 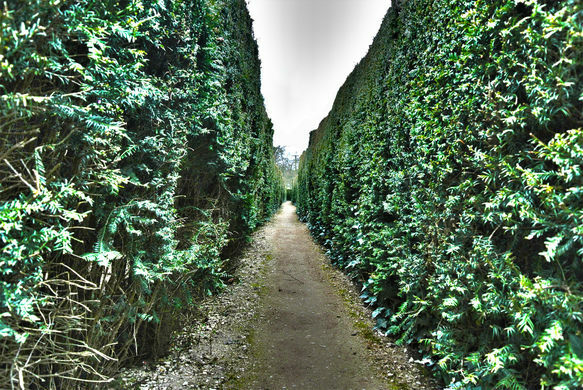 It’s the longest hedge maze in the world — but not the largest — and consists of more than a mile and a half of meandering paths, including dead ends. With six raised bridges and a tower from which to survey the entire maze, it’s one of the most striking labyrinths I’ve ever seen. It’s actually one of several mazes on the property — others include the Lunar Labyrinth and the Sun Maze — but it’s by far the largest on the property. Although it only dates back to 1975 (while some mazes in England date back centuries), it’s truly a sight to behold. To close out our look at labyrinths around the world, we venture into the southern hemisphere to explore the Enchanted Maze Garden in Arthurs Seat, Australia. 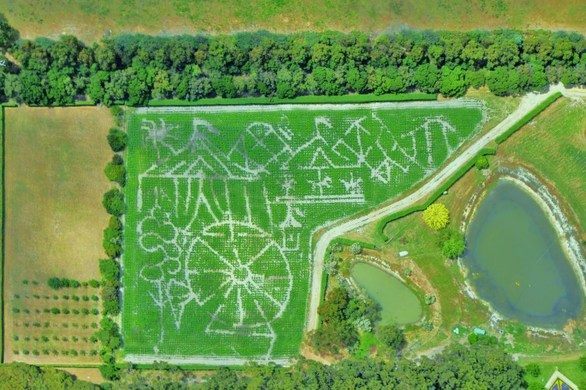 Although it is the year-round home of “a traditional hedge maze with a Japanese Garden at its center, an ancient turf labyrinth, and a circular roomed maze for children,” it’s the constantly evolving Maize Maze that puts Arthurs Seat in the record books every year. Each year, a new maze is designed, and with GPS assistance, over 100,000 stalks of corn are planted to create the Maize Maze. Sprawling across two and a half acres, the Maize Maze is open from mid-February through late April. 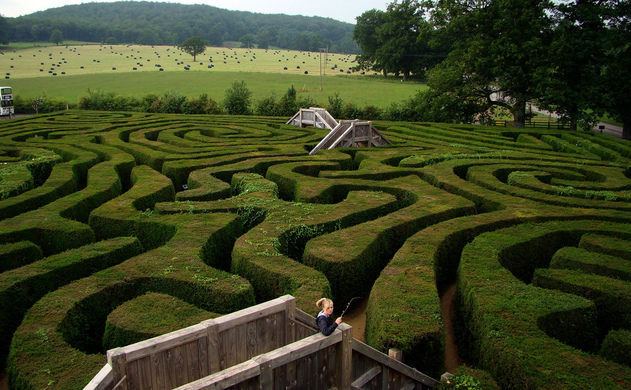 Hopefully these glimpses into the amazing depth and breadth of hedge and corn mazes around the world has you looking forward to springtime puzzling outdoors! Or, at the very least, not feeling so dreary about winter.